Worm farming is a good way to convert household biodegradable waste into compost, which can be used to improve the structure, composition and productivity of the soil. It is something that can easily be done, all the year round, in the backyard, apartment or office. Here is a step-by-step procedure to build a worm farm. 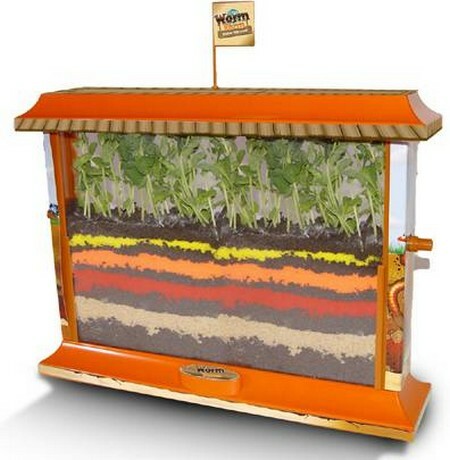 The most important thing that is needed for the worm farm is a compost bin, which should be approximately 60-cm high, 80-cm long and 30-cm wide. The size of the bin can vary depending upon the amount of space available. Either wooden or plastic container can be used of worm farming. While the former is a better absorbent and insulator, the latter maintains constant moisture level. The next step is to prepare the bedding. Shredded newspaper, cardboard, peat moss and straw are ideal bedding materials. It is advisable to use more than one bedding item so as to create a suitable environment for the worm to thrive, survive and multiply. Moisten the bedding before placing it into the compost bin. It should be as wet as a sponge from which the water has been squeezed out. A handful of garden soil should also be added to the bedding. Fill about three-quarters of the container with the bedding and to it add 1kg of worms. For proper drainage and aeration, drill small holes on the sides and bottom of the compost bin. Also turn the bedding periodically with the help of the trowel. The worms function well at room temperature. Hence, don’t keep the bin directly under the sun. Instead keep it in a dark, cool place, and cover it with an old newspaper to conserve moisture. From time to time, kitchen wastes like food scraps, chopped vegetables and fruits, crushed egg shells, tea bags, filters, coffee grounds, and the like can be added to the worm farm. Shredded cardboard and newspaper can also be added. Dairy products, poultry, meat, citrus fruits, oily food items and members of onion family like garlic, leek, etc. should not be added. Due to these items, an unpleasant odor starts coming out of the farm. The worms generally reproduce every 60 days. However, their population depends upon the size of the environment and the amount of food available. Under proper conditions, the worm decompose the bedding completely and form rich, dark brown compost, which can be used in the garden as such.